From the moment you enter the screened front entry into the foyer you'll feel at home in this spacious 3 Bedroom 2 Bath Pool Home built by Windemere. Situated on FOUR lots (.96 acres) with Southern rear exposure, large circular driveway and plenty of room to park your boat or RV. Shed and detached workshop with electricity are perfect for extra storage or to use as work space. Home has split bedroom floor plan, with master suite on one side, two guest rooms on the other. Guest bath doubles as a pool bath. Guest rooms have large walk-in closets. Open concept floor plan also includes Formal Living room, Family Room, Breakfast Nook and Dining Room. Kitchen features breakfast bar, closet pantry, microwave range hood, stove, refrigerator and dishwasher. Inside utility room with washer and dryer. 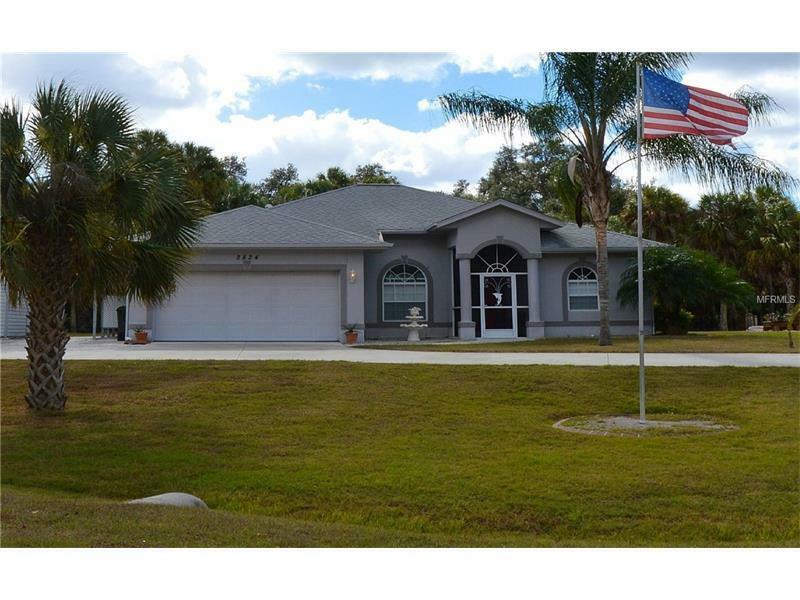 This home has plenty of space to raise a family or entertain guests long and short term. Original owner. New AC system installed December 2015. Great location with easy access to schools, shopping, beaches, golf and I75. Very private location, no fence, pet or deed restrictions.